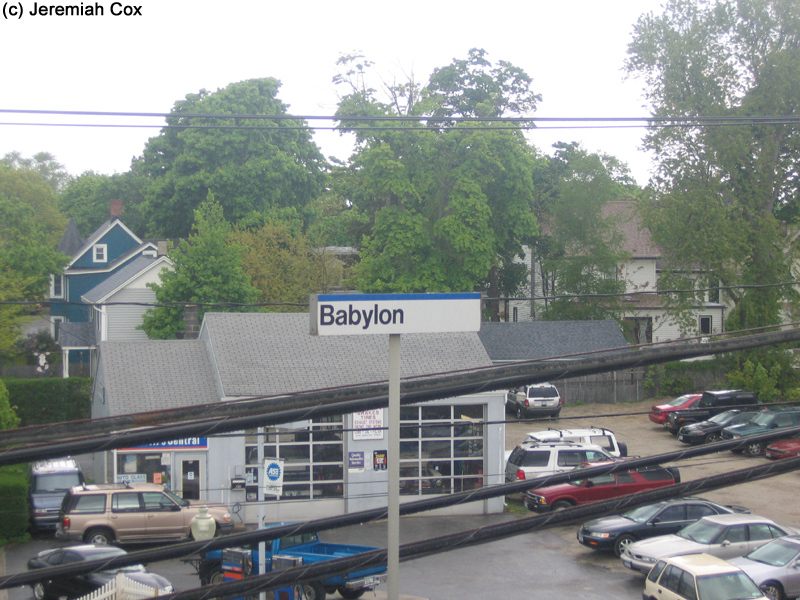 Babylon is the terminus of electrification on the Montauk Branch and has been since the third-rail electrification reached here on May 21, 1925. 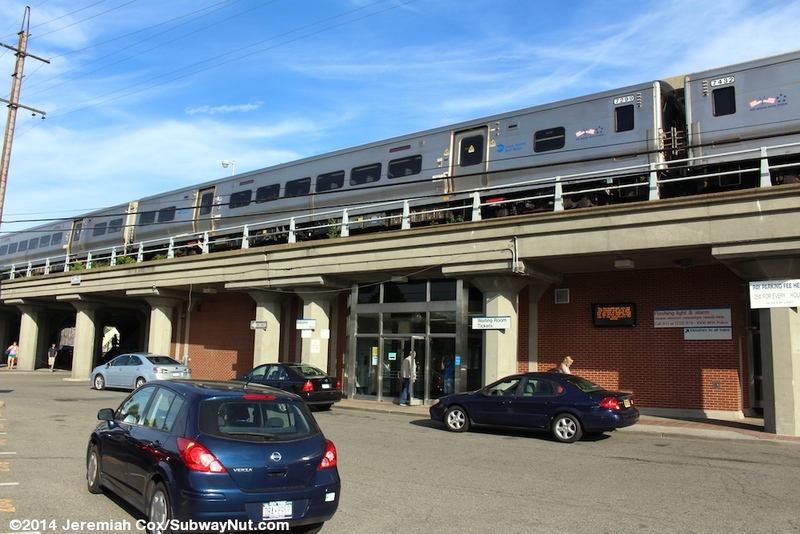 This makes the station a major LIRR terminus and connection point. 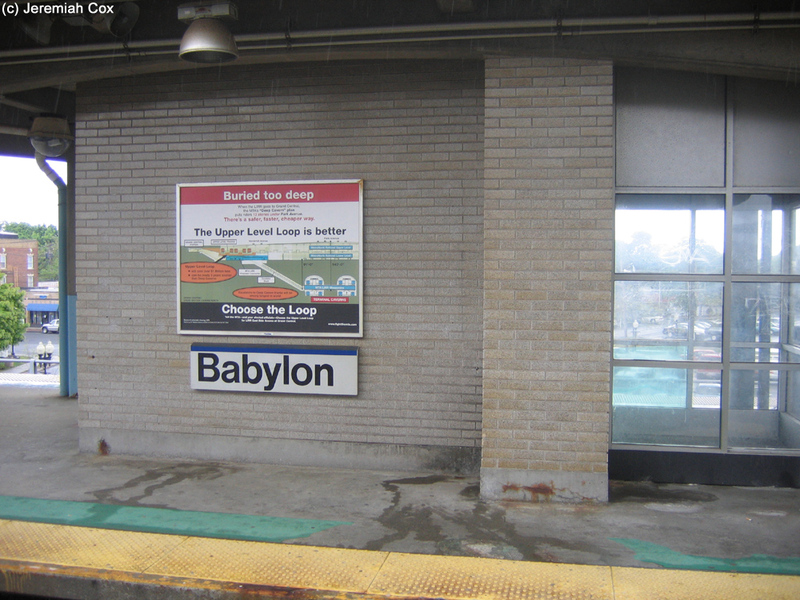 The name Babylon Branch is simply a way to differentiate in timetables between the frequent electric services running on the grade-separated line west of here that receives service from two local trains per hour, and additional express trains. 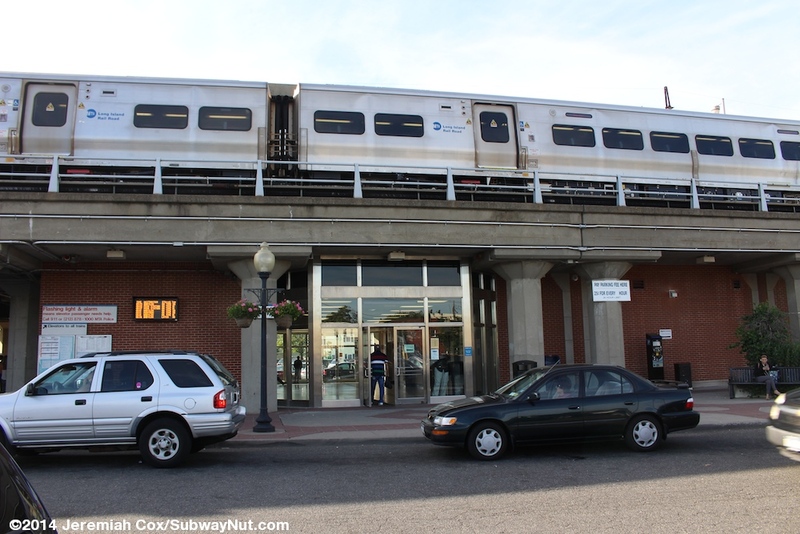 Some of these express trains connect with the roughly hourly diesel scoot service that makes local runs to and from Patchogue. 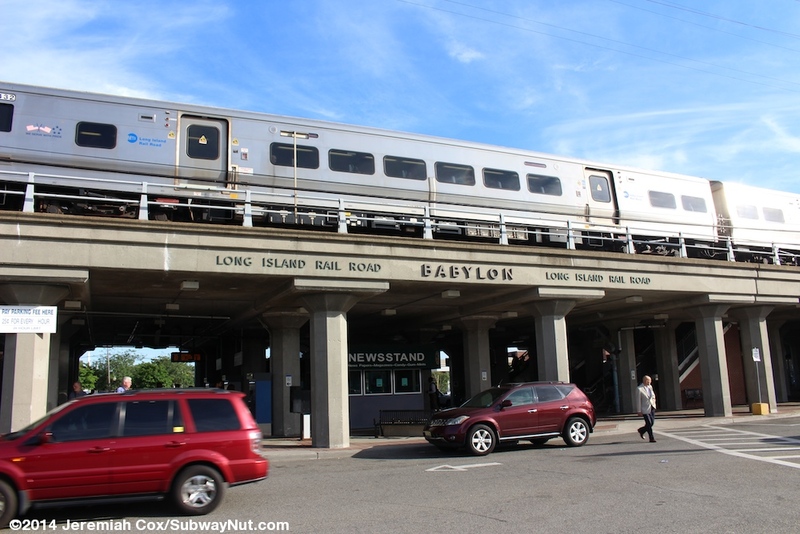 Continued service to Speonk and Montauk (only 5-6 round-trips per day run the full way out) is mostly provided by through diesel trains to and from Jamaica (Hunterspoint Avenue, plus a dual-mode round-trip into Penn Station during rush hours), but most of these trains also stop at Babylon for intra-island connections. 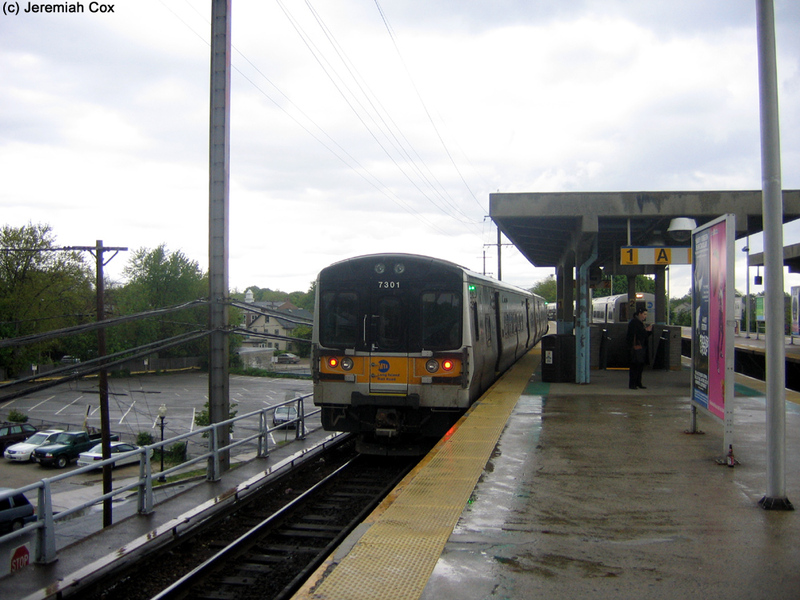 East of the Station is the Central Branch, an unpowered single track connecting line used by some Montauk Branch trains to run via the Main Line. 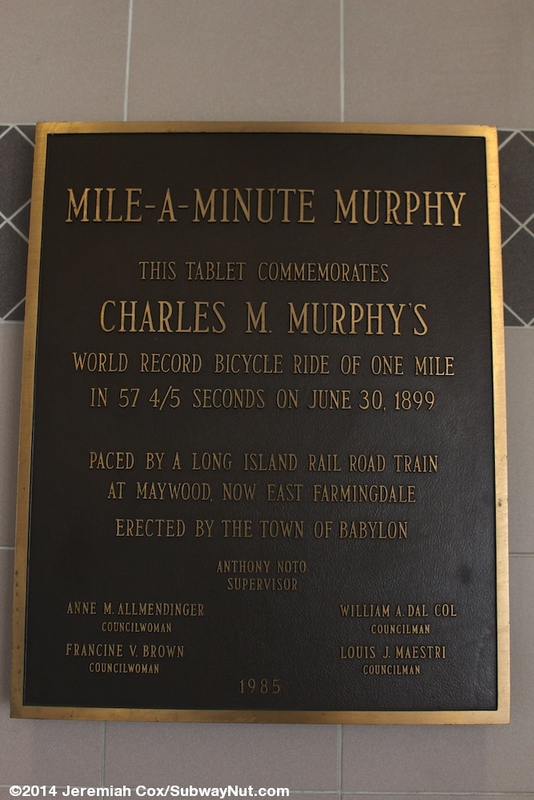 The track leads to the babylon Branch (the Main Line) between Bethpage and Farmingdale. 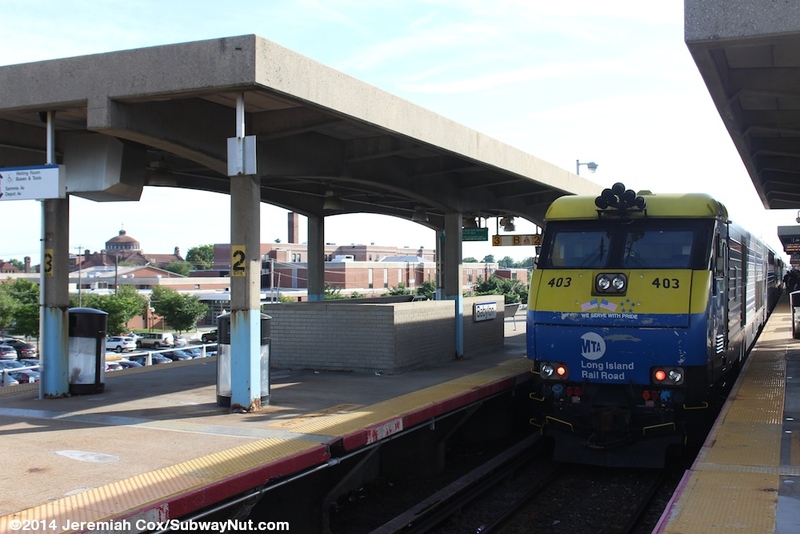 A few trains make intermediate stops at Mineola and Hicksville. Most Jamaica-bound diesel expresses can in theory operate at dispatcher's discretion although each train is scheduled to operate via one route or the other (chart from LIRR Today). 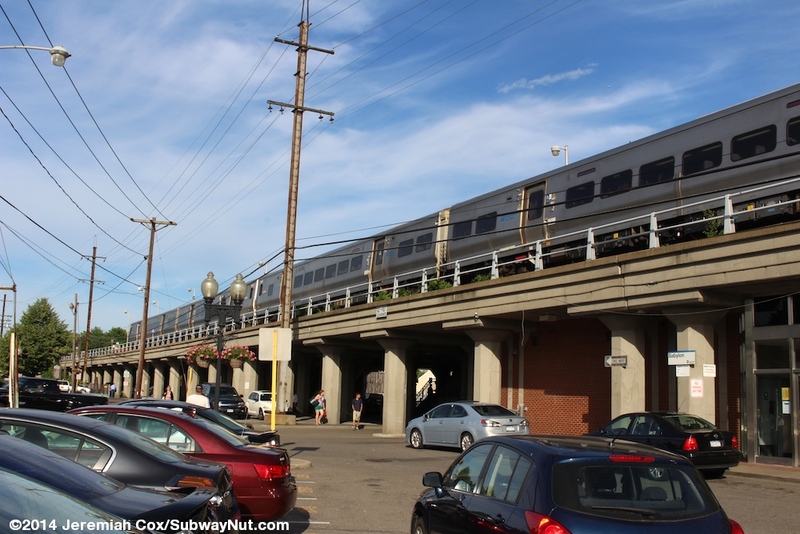 The original station was raised and the current station opened as part of the Babylon Branches grade separation project onto a concrete elevated viaduct opening on September 9, 1964. Many octagonal concrete columns hold up this viaduct. The current station has 3 tracks with 12 car two island platforms. 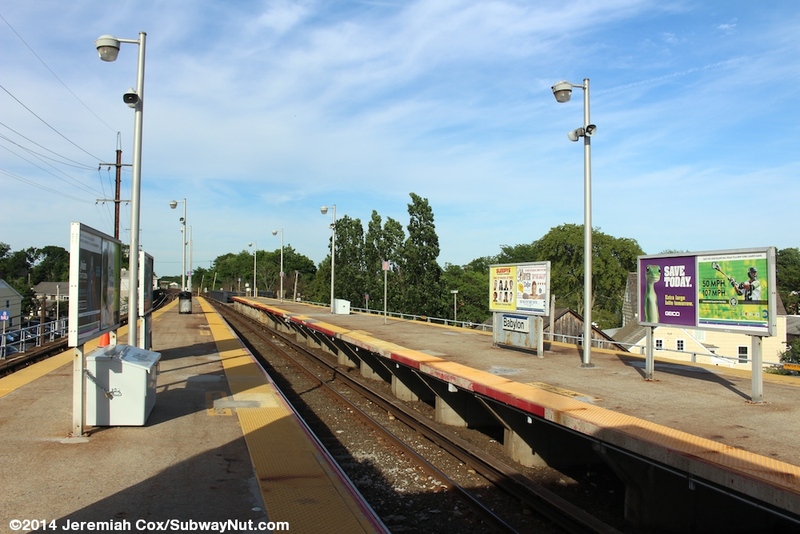 The middle track is normally used by the scoot diesel trains on the Montauk Branch providing the frequent scoot service to and from Patchogue. Track 1 is used for originating and track 3 for terminating Babylon Branch electric trains that run beyond the station to and from the Babylon Yard (with 17 sidings) east of the station. 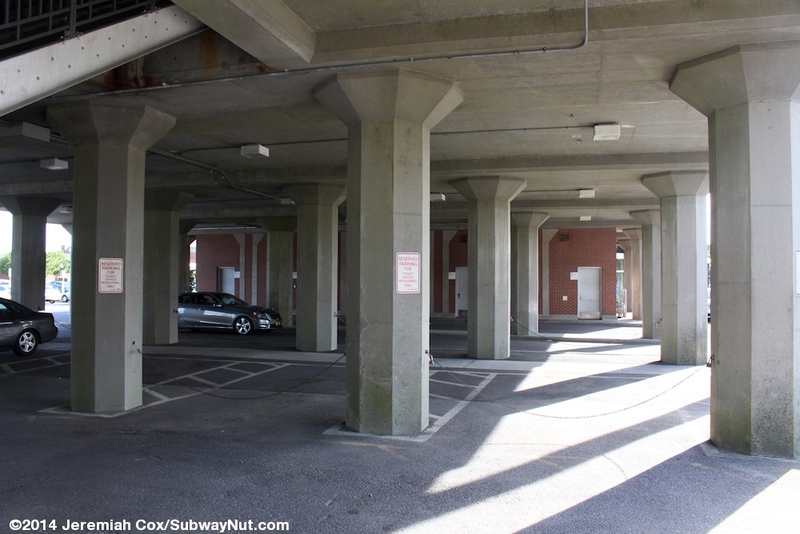 The platforms each have 3 distinct areas that have a concrete canopy held up by thin supports. 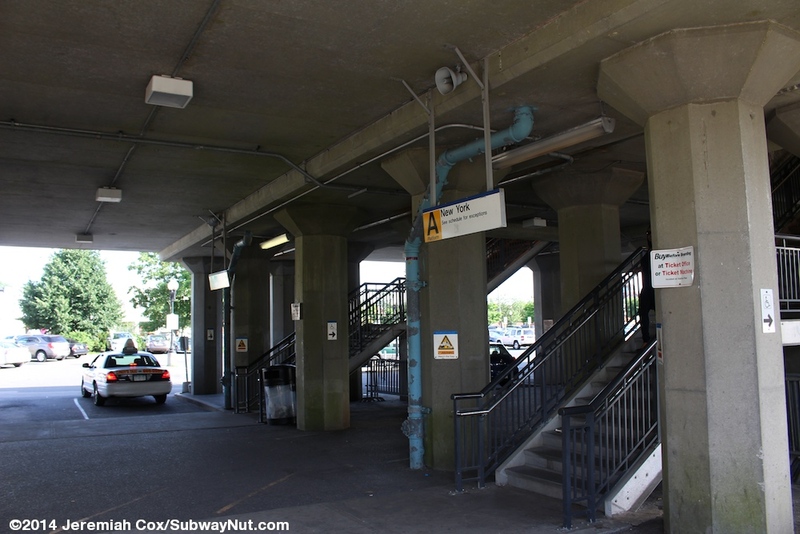 From the extreme western end, the first area, covering about two cars covers two staircases, one is at the extreme western end of the platforms where a staircase off of each platform meets at a narrow intermediate landing just above the sidewalk where additional shorter staircases at 90 degree angles lead down to the west side of Carll Avenue and access to additional parking lots along both sides of the tracks. There are more conventional staircases to the east side of Carll Avenue. 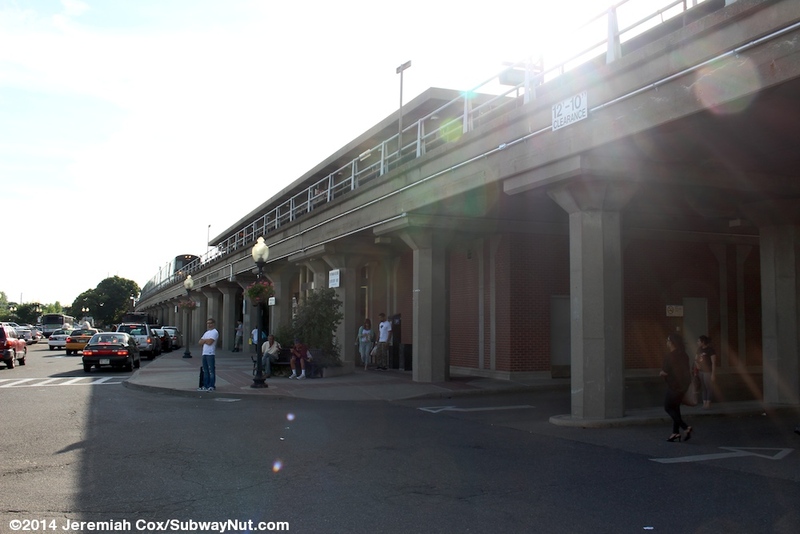 This staircase is also at the eastern end of the close in parking lots that surround the station area, leading south to Railroad Place and north to Sammis Avenue. In the middle of the platforms is where each platform has a waiting shelter directly on it. 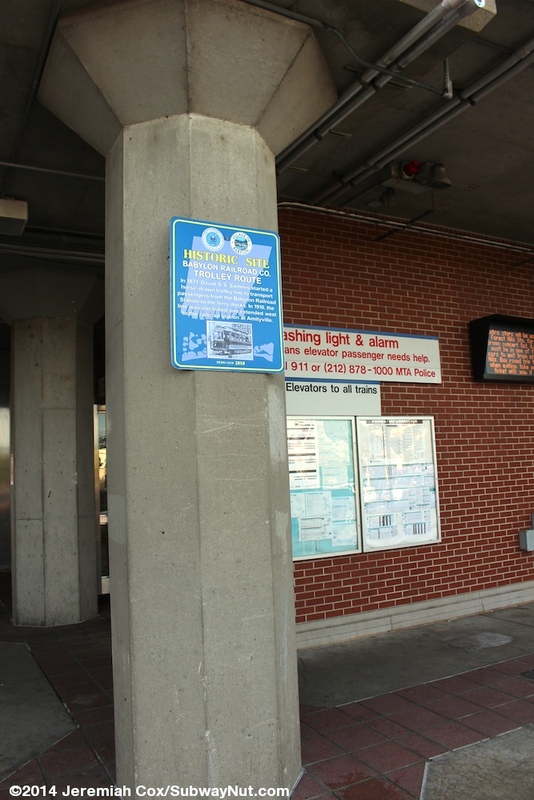 Beneath is the station house with a ticket office staffed daily, all day (6:00am to 9:00pm). 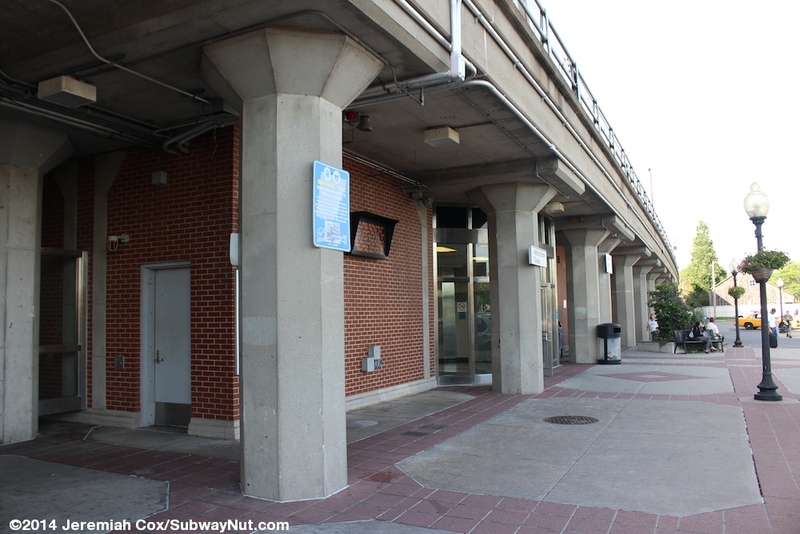 This station house is like the others nestled under viaducts along the Babylon Branch, although it is wider because their three tracks and two platforms above, not just one. 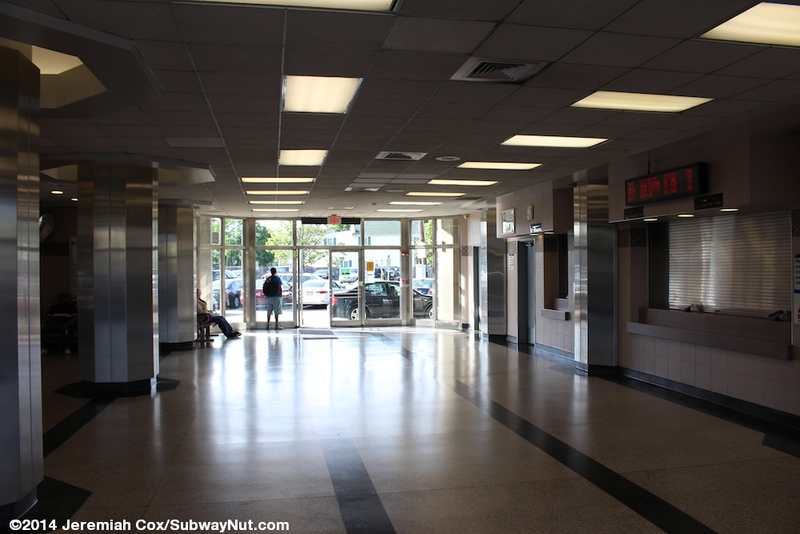 The interior walls are pink tile with silver metal sheeting surrounding the support columns that go through the waiting room. There are entrances from three sides with glass doors and large storefront-like windows that let plenty of natural light inside. 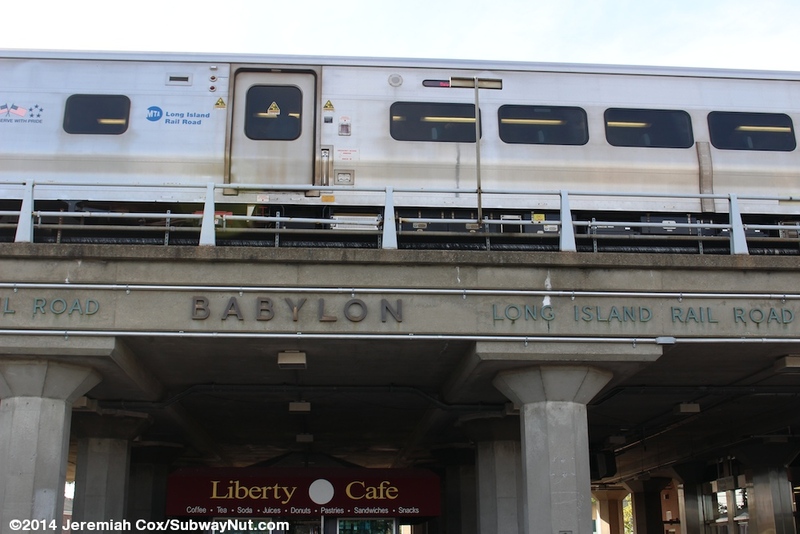 The exterior is brick and lettering that says Babylon Long Island Railroad is stenciled on the viaduct above on each side of this building. 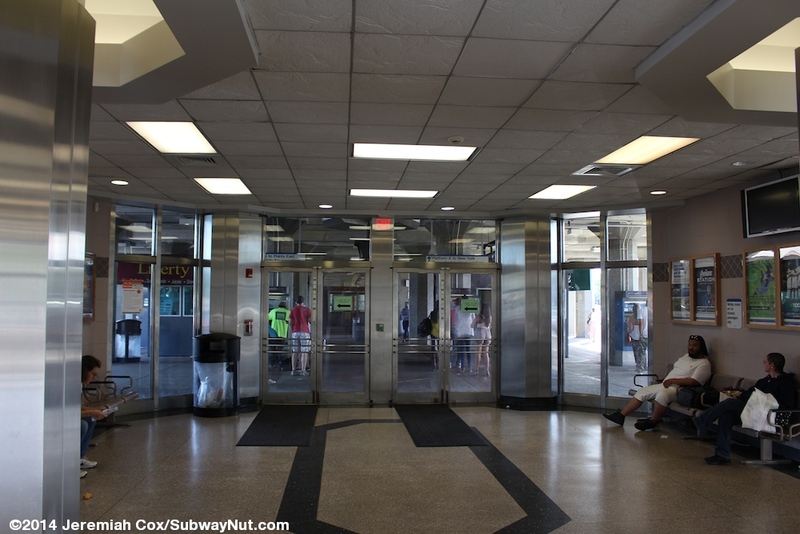 Directly in the walls of the station house is an elevator up to each platform and to one side is a combined staircase/escalator up to the platform. 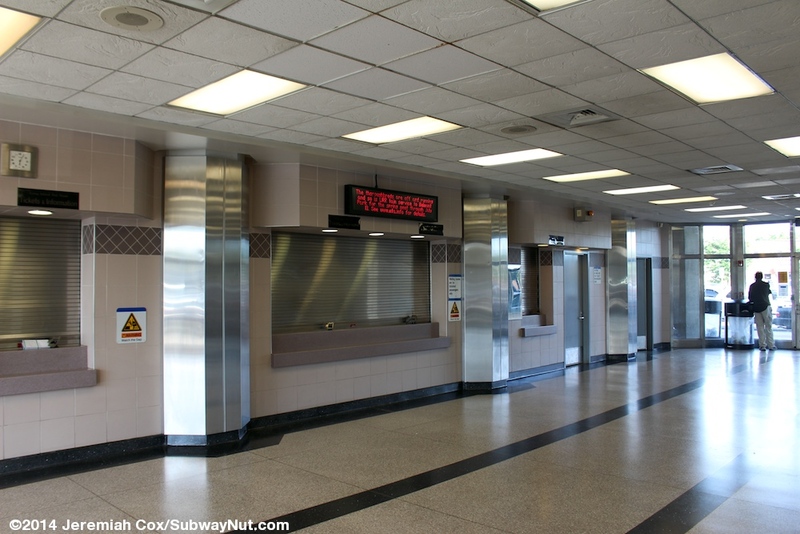 A newsstand and a concession have their own, small kiosks under the platforms nearby. After a gap of a car length there is one more small set of canopies that surround a final, forth staircase off the platforms. The platforms end with 3 car lengths exposed to the elements and just high, tall lampposts nearly at Deer Park Avenue that doesn't have its own staircase. 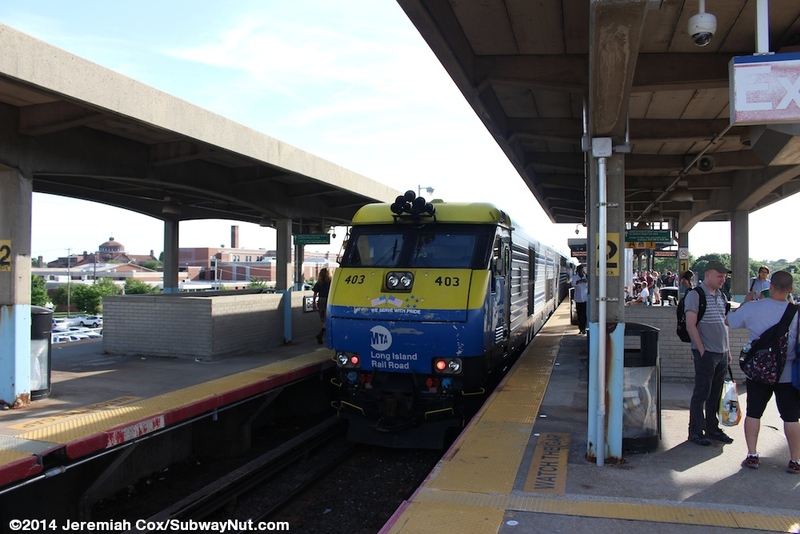 DE30AC #403 has just pushed a terminating Scoot Train from Patchogue (who's passengers wait for their connecting electric train to arrive) into Babylon. It will wait in the station until it becomes the next, 6:44 scoot train back to Patchogue.